Thomas Rhys Davids was born in Colchester, Essex, 12 May 1843. He was educated at Brighton School and Breslau University, where he studied Greek and Sanskrit. He held a number of posts in the Ceylon Civil Service, including District Judge and Archaeological Commissioner, 1866-72. He became a barrister, 1877. 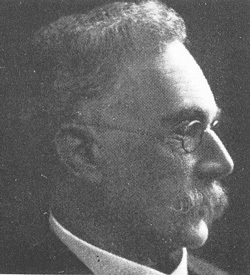 He was appointed Professor of Pali and Buddhist Literature at University College, London, 1882-1912, and Professor of Comparative Religion at Manchester University, 1904-15. He married Caroline Foley, 1894. He was a founder and President of the Pali Text Society, 1881-1922, and a founder of the British Academy, 1901. He was also Secretary and Librarian of the Royal Asiatic Society, 1885-1904, and he established the Indian Text Series, 1900. In his retirement, he wrote for the Manchester Guardian and worked on the preparation of a Pali dictionary. He died in Chipstead, Surrey, 27 December 1922. "In 1864 a twenty-one-year-old Welshman named Thomas Williams Rhys Davids went out to Ceylon to join the Ceylon Civil Service. His background was unusual in two respects: he was the son of a Welsh Congregationalist Minister, and he had studied Sanskrit in Germany. In Ceylon, as in India, the Sepoy Mutiny had caused both a great deal of heart-searching and a stiffening of resolve, so that Rhys Davids joined a government committed to a policy of Anglicisation. All formal education on the island was now in the hands of Christian educators and only schools teaching the Bible received government funding. Since only those with government-recognised qualifications could get jobs in government, Buddhists were effectively barred from such employment. became known as the 'Great Debate of Panadura', a two-day disputation at which the Buddhist bhikkhu Gohottivatte Gunanda defended Buddhism to the acclaim of an audience often thousand Sinhalese lay-people. Intended to demonstrate the superiority of Christianity and to drive a wedge between the Buddhist clergy and a seemingly indifferent lay community, these debates had the opposite effect. Widely publicised, they led to a resurgence of interest in Buddhism on the island, as well as initiating reforms. Two Buddhist secondary schools and a college were founded between 1873 and 1875, and a new sense of cultural identity began to take shape among the Sinhalese. A young Buddhist monk named Naranwita Sumanasaru Unnanse took it upon himself to start single-handedly clearing the acres of jungle that had swallowed up the ancient city of Anuradhapura, the capital of King Devanampiya Tissa at the time of Ashoka, in the plains to the north of Kandy. Word of his activities eventually reached the Governor, Sir William Gregory, and led to the appointment of an Archaeological Commissioner and the setting-up of an Archaeological Department. A year or two later Rhys Davids became locked in a dispute over a legal matter with a superior officer. A higher ruling went against him and as a matter of principle he resigned, returning to Britain to study law — and taking with him the malaria that periodically left him prostrate for the rest of his life. He became increasingly drawn towards a more serious study of Pali, and the interpretation of Buddhist texts. He looked at the efforts of such earlier Pali scholars as Tumour and concluded that Pali studies in the West needed to be organised, which led to his foundation in 1881 of the Pali Text Society, 'to render accessible to students the rich stores of the earliest Buddhist literature now lying unedited and practically unused in the various manuscripts scattered throughout the universities and public libraries in Europe'. Rhys Davids was at this time greatly influenced by Max Miiller' s work at Oxford on comparative religions. Max Müller had been thought too radical to take over the Oxford Chair in Sanskrit — but a new Professorship of Comparative Philology had been created for him, which he held with great distinction until his death. 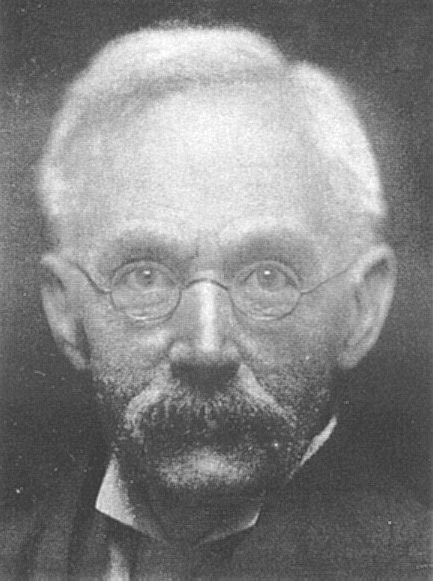 Max Müller was first and foremost a Sanskritist, but in 1872 he gave Oxford's prestigious annual series of Hibbert Lectures, speaking on the subject of the origin and growth of religions. He presented a new interpretation of Buddhism, now arguing that the 'gospel of negation' associated with Buddhism was a later accretion brought on by 'monkish orthodoxy', and that nirvana did not represent a doctrine of utter annihilation. This marked the beginning of a more positive attitude towards Buddhism in the West, one that depended almost wholly on readings of Pali rather than Sanskrit sources, thus on the Theravada rather than the Mahayana tradition of Buddhism. In Britain the main vehicle for this new thinking was Rhys Davids' Buddhism: being a Sketch of the Life and Teachings of Gautama, the Buddha, published in 1877 under the unwitting auspices of the Society for Promoting Christian Knowledge. Here was a rationalist explication that Protestant Britain — to say nothing of Protestant Germany and a large section of the United States of America — could understand and identify with."